The year 2002 was very important for sport in Płock. We were entertaining the participants of the 34th International Children's Games and at the same time we were celebrating the 120 year anniversary of sport in Płock. Płock offers an excellent opportunity for active rest and recreation to its inhabitants and visitors. Lovers of the sporting life style have at their disposal three stadiums, three roofed swimming pools, professional tennis courts, harbor, sport airport of the Mazovia Aeroplane Club. Old sport traditions in Płock date back to the XIX century. In 1882, the Płock Rowing Association was established - the second one in Poland. Nowadays Płock is home to the Rowing Olympic Training Center. The Cycling Association has been famous for over its one hundred year history (established 1899). Nowadays, 20 sport disciplines are provided in over 50 clubs in Płock. Inhabitants reach for the highest laurels both in local and international championships, e.g. competitors from Płock Rowing Association, handball players from Orlen SSA, chess players from Płock Chess Association. Płock organizes many regional, all-Polish and international sports events. Annually, rowers compete in rowing championships for the Polish Cup in Rowing. Other permanent events are: the International Championship of Poland in Wheel Chair Tennis (ORLEN Polish Open), "Tumska Wieża " International Chess Tournament, "Tumska Run", cup matches of the International Sports Federations. Sport events have their own permanent participants as well as supporters. The most popular are football matches of the premier league football team Wisła Płock and handball matches. Handball players' achievements are well-known throughout Poland. A team from Płock has been in the forefront for many years. The team has also taken part in the European Cups. Chess tournaments are equally thrilling. During the "Tumska Wieża" International Chess Tournament lots of bright minds compete against each other for the honour of winning. In May, the International Championship of Poland in Wheel Chair Tennis is held on the tennis courts. Tennis can be practiced in Płock year-round. In addition to open-air courts there are also roofed courts at the municipal stadium. All year round, Płock rowers take part in the all-Polish competition and in autumn, they compete for the Polish Cup in Rowing to win, so called the Juliusz Kawiecki Memorial. There are also sailing championships in Płock, during which competitors can win the "Heather Cup" and "Autumn Cup", founded by the Mayor of the City of Płock. "Podolanka" municipal swimming pool, a modern sports and recreational complex, is a place where the Polish Championships in swimming are held periodically. Lovers of horseback riding can choose between two centers near Płock. In Lack is the Stallion Stud where Horse-riding Championships are held annually, another stable is located in Cierszewo. 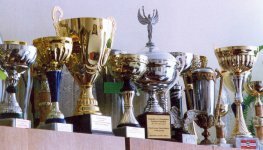 The students of "Małachowianka" take active part in various competitions and can pride themselves on numerous achievements.